Roof Cleaning – good or bad? 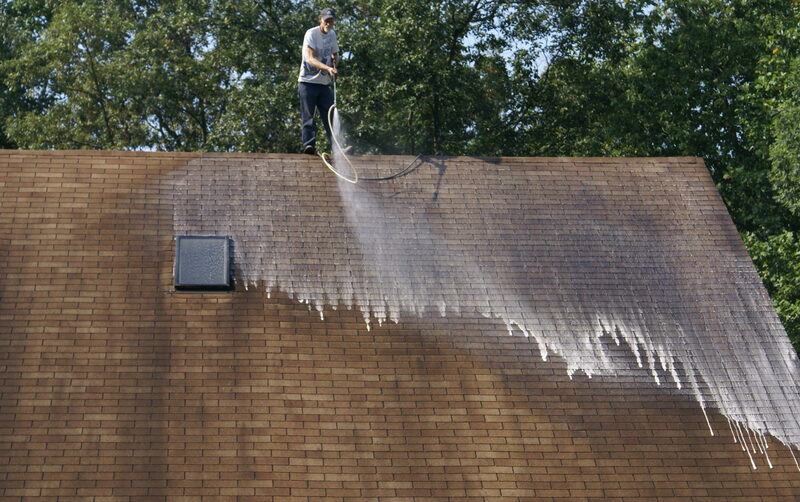 Roof stains can occur from several areas. Algae, lichens and moss growth due to a compost base are the most common. None of the three are good for a roof what so ever. As with everything, there are different opinions about roof cleaning. Below are three of the most common ways to roof keep a roof clean. 1. Use a non toxic and “green” solution to soak and gently wash off with a very low pressure water hose. This is a quick way to see instant results but are a bit more costly as is most eco-friendly products for a home. 2. Clean with chlorine bleach and typically with trisodium phosphate. This method is a soak method, let dry and then re-apply. Always wash this solution off after it drys with a low pressure water hose to wash off the algae, debris and excess chemicals. Note, it is always recommended with this process to water all shrubs and plant beds around the house before and after this process. 3. Pressure washing with a high pressure power washer to remove roof stains is an absolute No No! This process destroys asphalt shingles and removes granules that protect the asphalt base of a shingle from UV rays. Especially with older roofs! Regardless of the system you choose, always consult with a local and certified roofing contractor. When removing roof stains that have built up over time. It is always best to make a decision based on advice from a reputable roofing company. A clean roof with always improve a home’s curb appeal. If it is not done the proper way you can shorten the life and have to replace your roof far before it’s standard time. Roof Cleaning - good or bad? Roof stains can occur from several areas. Algae, lichens and moss growth due to a compost base are the most common. None of the three are good for a roof what so ever.